Organic running shoes are a smart, functional way to hit the pavement. You should always choose running shoes with support and enough impact-resistant material to keep your feet, ankles, hips and spine protected. Now, manufacturers are making it easier for you to select shoes that are just as protective of the environment as they are of your body. Running shoes are a staple product for the runner, but the rate in which runners go through shoes is worrisome because of the amount of waste created. Manufacturers are churning out shoes in such large numbers that pollutants from the manufacturing process are entering the air at alarming rates. The good news is some manufacturers are making changes to lessen the impact. Manufacturers are making changes to the way they produce shoes, though changes in running shoes have been slow to come. One way manufacturers are making the change is to reduce the amount of Polyvinyl Chloride or PVC used in shoes. PVC produces carcinogenic dioxin when used in production. Now, manufacturers are using a much less toxic product called ethylene vinyl acetate, or EVA. They are also incorporating the use of thermoplastic polyurethane, or TPU in the same way. Other problem stems from the glues used. By eliminating glues containing Volatile Organic Compounds or VOCs, they reduce the amount of fumes entering the environment during production. This includes some of the most common glues used like neurotoxic toluene. Another large problem for many running shoe manufacturers is the problems of labor abuse, which many of the largest companies have accusations. These changes, while not directly related to the environment, are just as important to look for in shoe manufacturers. Running shoes have to fit and deliver in terms of performance. This is one of the main reasons to buy running shoes from trusted manufacturers. Fortunately, these companies also are taking the lead in producing more environmentally friendly or organic shoes. 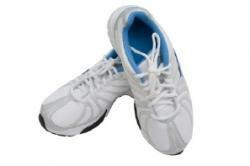 Nike: Running shoes offered by Nike are one of the best choices. Nike has been a leader in eliminating toxic materials from shoe production. They recycle and reduce waste throughout their production process. Additionally, they've substantially reduced emissions produced during manufacturing, making them a leader. Nike's Reuse-A-Shoe recycling program is a fantastic opportunity to recycle any brand of shoe. New Balance: New Balance is perhaps the best choice when it comes to employee relations, since the company is the only one that has US production factories in operation. Shoe boxes are made from 100% recycled material. Reebok: Reebok has invested in recycling programs extensively and now claims that 90% recycled paper is used in their shoe boxes and papers. All factories and suppliers are listed, which means they aren't hiding who is manufacturing their shoes. Adidas: Adidas running shoes are a good option for organic shoes because the company has reduced the use of VOC emissions within their manufacturing process from a high of 140 grams per pair down to 19.3 grams per pair. Asics: Another leading company in running shoes, Asics has also helped to lead the way of environmentally friendly manufacturing. The company has used EVA foam (safe for the environment) since the 1950s. The company has also started using less harmful to the environment tannin over carcinogenic heavy metal chromium in their processing of leather. The company also has an EcoPet program, where collections of synthetic school uniforms and shoes take place in 500 schools. When looking for organic running shoes, keep your eyes open. New products are headed to the markets all the time. For example, Nike is working with the National Basketball Association's star Steve Nash, to produce the first eco-friendly basketball shoe, using scraps from the factory floors for production. As you shop for running shoes, keep comfort and support in mind, but find out what the shoe's manufacturer is doing to promote better environmental protections in their factories. For more tips on selecting the right footwear for your needs, visit LoveToKnow Shoes.